From sweet summer sundresses to the hottest runways of Paris, lace has been, and will always be, synonymous with style. There are several primary variations of lace, each using different techniques and capable of creating entirely different weights and looks. The best known, especially in terms of historical portraits, is needle lace, which is handmade using a needle and thread. Bobbin lace, such as chantilly lace, which made using a bobbin and a pillow. Another variation of this Tape lace, where thicker strands called “tape” are shaped into pretty patterns and attached to the other strands using a crochet hook. Cutwork lace uses a technique in which sections of the fabric are cut away, and the inner edges of the cut sections are reinforced with thread. Eyelet lace is a variation of this style. Macrame and tatting are also considered style of lace, which is made with a shuttle or a special needle called a “tatting needle”. Crochet has only recently begun to be accepted as a method of lace-making, as it is often considered “easier” and less time-consuming. Crochet uses fine thread and decorative stitches and is characterized by flowing lines and scalloped edges. Knitted lace also is known for using the eyelet style. Due to its complexity and the difficulty of creating a stable woven fabric with so many built-in holes, it is often considered the pinnacle of achievement for anybody who knits. The most modern variations of lace-making are machine-made lace (fairly self-explanatory), and chemical lace. Chemical, or schiffi lace, is particularly interesting as it is sewn into a special kind of fabric that is designed to disintegrate after the pattern is created. Early records describe lace variations appearing in Italy and Flanders in the late fifteenth century. As all lace made at this time was completely hand-made, the sheer number of man-hours required to create it made this textile an instant luxury item only available to the clergy and the nobility. In fact, a single square inch of needle lace could take an artisan over two hours to make. While needle and bobbin lace were more common at this time, there is evidence of cutwork lace variations used in ribbons and trims. One of the reasons that lace became so popular as embellishment was that, in a time when people were often sewn into certain articles of clothing, lace could be tacked on and removed from any garment in a nobleman or -woman’s wardrobe, and reapplied to another. Lace was often applied to the collars and cuffs of both men’s and women’s clothing, as well as worked into shawl, veils, and decorative furniture coverings. That’s right, those lace doilies that you find on every available surface of your grandma’s house was once considered a great show of wealth and prestige. You know you’ve got money when you can have pieces of the most expensive textile of the time simply draped over your couch or set on a table, just for the sake of showing off. 1574 that was intended to keep the nobility from spending beyond their means in an effort to remain fashionable. Which, considering her own fashionable excesses, was quite the statement..
Lace became highly prized during the Renaissance. It was used to embellish anything that people could afford to embellish, from collars and cuffs and gloves to altar cloths. It was often included in the trousseaus of young brides and was specifically bequeathed to family members in wills. Such excesses were spent in the importing of lace that many countries elected to create their own local lace designs to keep the money being spent within their own nation’s economies. Due to its popularity, the manufacture of lace became integral in many communities, and as majority of lace-makers were women, it is believed that the lace-making industry was one of the earliest sources of financial independence for women at the time. This lace trend continued in popularity long into the 1700’s. Wealthy nobles continued to sew it onto the cuffs of their sleeves, and the sleeves of their gowns, or tied it around the neck as a frothy jabot. The more lace you wore, the more wealthy you appeared. 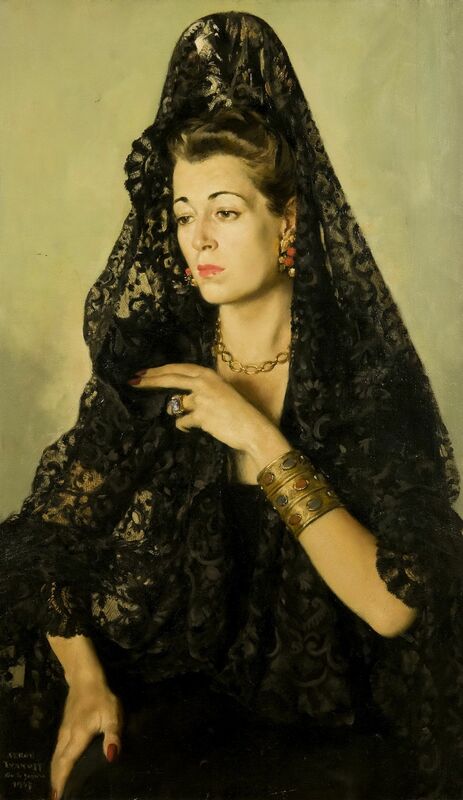 Lace veils called mantilla were particularly popular in Spain in the 16th and 17th centuries. These veils were attached to a large comb that framed the back of the head called a peineta, which was originally made of tortoise shell but is now made of acrylic or plastic. Queen Isabella II was a vocal supporter of the wearing of these veils, and they remained a common accessory until her abdication in the late 19th century. Though they are still worn today, their use is limited predominantly to special occasions like bullfights, holy week (the week leading up to Easter), and weddings. The biggest turning point for the industry, and for the textile industry as a whole, was the Industrial Revolution. Following the invention of the “spinning jenny” and “cotton gin” in the late 1700’s, the amount of yarn and cloth that textile producers were able to generate increased exponentially, which drove down the price of cloth tremendously. It wasn’t long after that inventors were successful in creating a lace-making machine. This invention was a striking blow to the cottage industry, costing thousands of lacemakers their livelihoods. It was for this reason that when Queen Victoria married Prince Albert in February of 1840, she chose to build her entire wedding ensemble around an elaborate piece of handmade Honiton lace, in an attempt to stimulate the dying local industry. It is said that over 100 workers spent six months creating the ensemble, creating the lace veil and train, as well as the central lace piece that the ensemble was designed around. Today almost all lace is machine-made, though some hand-made pieces are still produced for use in luxury garments. Bands and insets of lace are often added to simple designs to give them an air of delicacy and romance, something that is particularly common in bridal fashion.